LESSON PLAN in Elements, Atomic Spectra, Identifying an Unknown, Emission Spectrum, Electromagnetic Spectrum, Emission Spectrum. Last updated October 11, 2018. 5-PS1-3: Make observation and measurements to identify materials based on their properties. List the elements found in Earth’s lithosphere. List the elements found in Earth’s atmosphere. Explain the elements found in the atmospheres of other planets. Describe how scientists identify the elemental composition of objects in space. 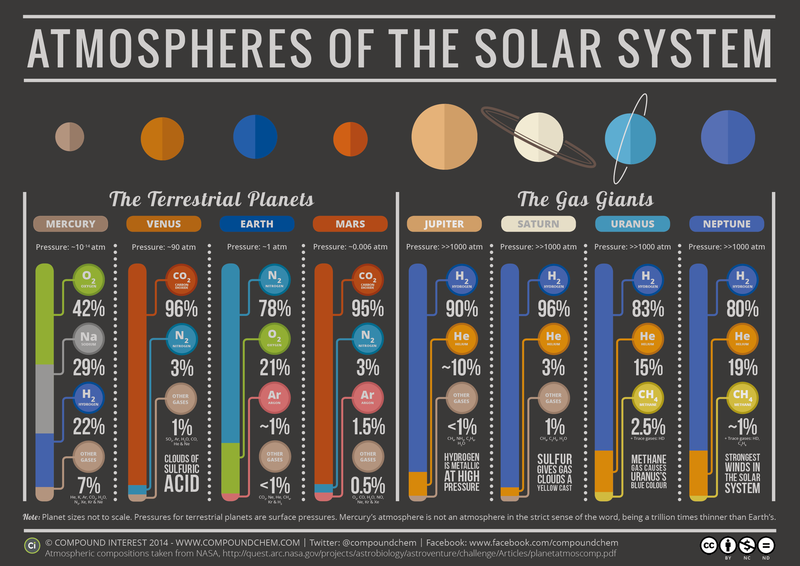 Compare the elements found in Earth’s atmosphere to those found in the atmospheres of other planets. Source information about the elemental composition of Earth and other astronomical objects – this could be websites or books. Example websites include Elements in Earth’s crust, Elements in Earth’s atmosphere, Sun, and Saturn’s atmosphere. A more extensive list of sample websites can be found in Teacher Notes. Note cards with the names of planets and astronomical objects written on them (one card per student), but cards can be replicated to place students into groups. Alternately, copies of the Astronomical Objects cards can be copied, cut out, and given to students. No specific safety precautions need to be observed for this activity. Prior Knowledge: If the students have not had prior experiences with the periodic table, it will be necessary to explain that everything is made of matter and that matter is made of atoms. There are different types of atoms that combine to form the objects in the world around us, and to form us as well. These different types of atoms are identified as elements and we organize them on a chart called the periodic table of elements. It may be helpful to use this Periodic Table of Elements lesson from the AACT resources page. The teacher will ask the students to refer to the periodic table and brainstorm the elements that they think the Earth is made up of. After providing the students with some time to think and review the periodic table, the teacher will ask them to use their student handout to write down the elements that they think comprise the earth’s atmosphere, the percentage of the atmosphere they think each element takes up, and to explain why they think those elements are present. The teacher will also ask them to write the percentages for how much of the Earth is composed of each element. The teacher will then explain that the students will perform some research to verify their predictions. The teacher may steer students to use specific websites, such as Cool Cosmos. The teacher may also choose to print out the information to share with students or allow the students to perform their own online searches. The students should use their handout to record the actual elements and percentages. See the answer document for completed charts. If the creation of graphs is to be included in the lesson, the students should be steered away from Google searches that may provide them with quick graphs. The students will then compare the charts containing the actual numbers with their previous predictions. After the students have found the elemental composition of Earth’s atmosphere and lithosphere, the teacher will explain that the students will use the percentage information they collected to create pie charts to represent the composition of earth’s atmosphere and earth’s lithosphere. Students can use the Create a Graph website to quickly create pie charts. Part 2: How do they know that? This section of the lesson is designed to help students understand how scientists use their understanding of chemistry and the electromagnetic spectrum to determine the elements that make up objects in outer space. Scientists can use a spectroscope to determine the elements various objects are made from. Spectroscopes and spectrometers use light and separate it into the colors it is made of. Each element on the periodic table has a specific color signature, which can then be used to determine the elements the object is made of. This page by Scholastic explains the idea of using spectroscopes to better understand stars, while this page by Cornell describes the use of spectrometers. Teachers may also have students create their own spectroscopes using this AACT resource, Build a Spectroscope. Part 3: What makes up the other items in space? The teacher will ask the students to explain whether they think the other planets and items in space are made up of the same types of elements and to explain their thinking, as found in part three, question one on the student handout. The teacher will tell the students they will be working in groups to perform internet research to verify the correct answers. The teacher will provide students with the name of the astronomical body that they will conduct research on. This can be done by handing out notecards with the names of different planets and astronomical objects written on them (see downloadable cards). The items to be researched could include the sun, Mercury, Venus, Mars, Neptune, Jupiter, Saturn, Uranus, Pluto, asteroids, meteorites, etc. Similar to when the students researched Earth, the students can be provided with specific websites, for instance, Sun, Saturn’s atmosphere, Venus’s atmosphere, Mars’s atmosphere, and Jupiter’s atmosphere to search, they could use books about the solar system, or they could be provided with print outs of the information to determine the elemental composition of their assigned object. Once the students have collected their data, they should create an infographic that includes a pie chart to represent the elements that make up the object and an interesting fact about each of the three most abundant elements in their object. Students could create an infographic using regular document software or using free programs such as Piktochart or Canva. Groups of students will give presentations to share their findings with the class. The class can then participate in a gallery walk and be asked to identify common elements among all of the infographics and to compare percentages between charts. Classroom management tips: Small groups of students (3 or 4) may work best. Possible group roles include researcher (all students research but this student confirms accurate information), recorder, graphic designer. Differentiation: Depending on the amount of class time available and access to information about the various astronomical objects, you may choose to pre-select the sources of information and/or websites the students use to collect their information. Students can be assigned astronomical objects based on the level of difficulty in creating the pie charts. For instance, students might be asked to create pie charts for both the composition of the atmosphere and the planet for Mars. Atoms of elements are all around us and they make up the objects we see and even those we cannot see. Today we are going to explore the elements that make up our home, Earth, as well as the other objects in space to determine how many elements are out of this world. Use this chart to make predictions for the elements that you think make up the Earth. Be sure to include what percentage of Earth is made of the element and explain the reason behind your prediction. If you need additional rows, you may use a new sheet of paper. Use this chart to make predictions for the elements that you think make up the Earth’s atmosphere. Be sure to include what percentage of Earth’s atmosphere is made of the element and explain the reason behind your prediction. If you need additional rows, you may use a new sheet of paper. After conducting research answer the following questions. Use this chart to document the actual percentages of the elements that make up Earth. Use this chart to document the actual percentages of the elements that make up the Earth’s atmosphere. Explain the accuracy of your predictions. Were you correct in predicting any of the elements or their percentages? Explain. Create a pie chart to show the percentage of each element in Earth’s atmosphere. Create a pie chart to show the percentage of each element that makes up Earth. What tools might scientists use to determine the elements found in Earth? What tools might scientists use to determine the elements found in other planets or objects in space? Predict - Are the same elements in Earth’s atmosphere found in and on other planets? Explain your thinking. Use the resources provided by your teacher to explore elements in space to answer the following questions. Which astronomical object were you assigned? Use this chart to document the actual percentages of the elements that make up the object you were assigned. Create a pie chart to represent the percentages of elements found in your assigned object. An infographic is a poster that includes graphics and information. Create an infographic about your assigned astronomical object. You will share this infographic with the rest of the class. Which elements are found in your object and Earth? How do the percentages of elements for your object compare to the percentages of elements found in Earth? Listening Guide: Complete the chart as your classmate’s present information about their object. Which element appears in the greatest number of objects? Which element appears in the fewest number of objects? Which element is the highest percentage of the atmosphere of all of the objects? Look carefully at the elements’ location on the periodic table. Explain the types of elements that are found in objects in space. Why do you think those types of elements are in space?